It's a futuristic Johannesburg, South Africa, lots of crime kept under control by a robotic police force. One "rejected" robot becomes the guinea pig in an experiment to see if a robot can be made to think and feel as a human. Several warring factions come together in this film that explores the issues of playing God and what makes us human. Dev Patel (who is not hamming it up quite as much as he does in the "Exotic Marigold Hotel" movies) is Deon Wilson, the creator of the robot police force (Scouts) that can understand human speech and take orders from humans. He works for Tetravaal, a company run by CEO Michelle Bradley (Sigourney Weaver, who doesn't have a whole lot to do except look angry or concerned, but I am always happy when actresses of a certain age are working). But what Deon really wants to be able to do is create a robot that can think and act on his own. After a long night of Red Bull, though, he thinks he has mastered the program. Now he just needs a robot to test it on. Then we have Vincent Moore (Hugh - What Can't This Guy Do? - Jackman) whose religion is against artificial intelligence. He has created "Moose," a huge robot that takes orders from the mind of its operator. However, Vincent's creation has taken a back seat to the droids Dion has created and Vincent is not happy about it. Add to that mix a trio of hapless criminals, Ninja, Yolandi (Yolan-di Visser) and America (Jose Pablo Cantillo) who owe their drug supplier 20 million and who need one big heist to pay him back. They get the "brilliant" idea to kidnap Deon and steal his remotes that control the police robots so they can turn them off. They kidnap Deon only to find that there are no remotes, no on/off switches for the robots. But what they do find in Deon's van is a rejected robot that Dion was planning to use for his experiment. The bad guys order Deon to put the robot together because Ninja wants a badass, gangster robot to help them with their heist. Deon explains that the robot will need to learn language and how to do things because at first he will be like a baby. So we have a Pygmalian-like tug of war as the Mad Max-like-thugs try to make Chappie into their likenesses while Deon tells Chappie he must not rob or hurt others. Chappie takes Deon very seriously as Deon is his "creator," but he also thinks of Yolandi and Ninja as Mommy and Daddy and he also wants to do what they tell him. This film is written and directed by South African director Neill Blomkamp who brought us the wonderful and original "District 9," which was nominated for an Academy Award for Best Picture in 2009. Here what's interesting is the blurred lines between who are the bad guys and who are the good guys, not to mention the charming Chappie, whose antennae act like doggy's ears as he reacts to the world around him. You can't help but love him. Hugh Jackman is almost unrecognizable in his mullet, but once again, even as a villain, this guy is hugely talented. Dev Patel has that over-the-top personality so in evidence in the "Exotic Marigold" movies, but here he is toned down and believable. But other than Chappie, Ninja and Yolandi were stand outs. And then there is Chappie. 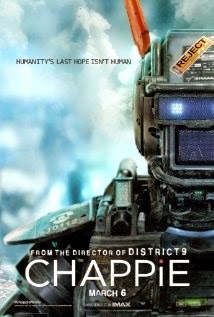 Copley brings Chappie to life. You really feel for him. Yes, I teared up. However, there are some plot problems, like why the bad guys would let Deon go and why Deon would leave Chappie behind with them, but if you can ignore those and think of this as a sort of fairy tale - "Transformers" meet "My Fair Chappie," there is humor, lots of action and pathos. Rosy the Reviewer says...Chappie is a fine chap who you will enjoy spending a couple of hours with. It's been 20 years since Lloyd (Jim Carrey) and Harry (Jeff Daniels) have seen each other and now it's time to find Harry's daughter. They need to find Harry's daughter, Penny (Rachel Melvin), not just because Harry didn't know he had a daughter, but because he also needs a kidney. They do find Harry's daughter Penny, and guess what? She is also dumb. Geez, how funny. If you think that's funny, then this is for you. Or perhaps a long segment of Harry pulling a catheter out of Lloyd or throwing a banana peel into a coffin at a funeral is funny to you. Toe licking? Farting into the back seat of a hearse and then shutting the partition so the person in there is stuck with the fart? A cat who farts feathers after eating a bird (Farting is big in this film)? If that sort of thing is funny to you then fine, you might like this. All I could say was "Ew," and that was when I wasn't shaking my head asking myself "Why are you here?" The funniest bit is the opener with Harry visiting Lloyd in a mental hospital where he has been for 20 years. Harry has been visiting him every week for all of that time and when Harry opens up to Lloyd and tells him he has a health issue, Lloyd jumps up and says, "Gotcha!" He's been faking it for 20 years. Harry then asks him, wouldn't ten years have worked just as well? They debate that and that's kind of funny. That's kind of funny but it was downhill from there. I only kept watching because I am not a quitter and actually I was in shock. It wears you down after awhile - one stupid joke after another until your immune system to bad comedy has been compromised. Kathleen Turner plays the mother of Harry's daughter and one wonders why she would subject herself to this film. She suffers from almost debilitating arthritis and she doesn't look good. The Farrelly brothers have produced some funny films: "There's Something about Mary," and "The Heartbreak Kid" but this isn't one of them. 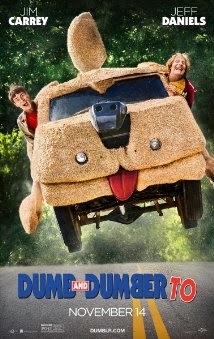 Even the first "Dumb and Dumber" was kind of funny, though not my cup of tea, but here, there is not a laugh to be had despite Jim Carrey, for whom I am a huge fan. Maybe the Farrellys need Ben Stiller who starred in the aforementioned films. All Rosy the Reviewer can say is...during this film I felt my own IQ dropping about 50 points. This film is the single-handed reason NOT to do a sequel, especially 20 years later. This story and characters have not aged well. A day in the life of a young German law school drop-out living in Berlin who just wants a regular cup of coffee. 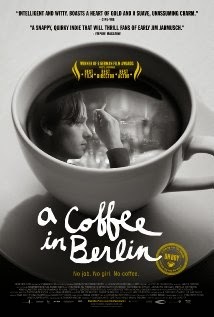 Nico Fischer (Tom Schilling) encounters a series of people during his day. His douche bag (pardon my German) psychologist who will determine whether or not our hero will get his license back (he got a DUI). However, the psychologist asks all kinds of leading and trick questions until it becomes apparent our hero won't be driving for awhile. His nosy new neighbor whose wife sends him up some rock hard meatballs, which seems funny at first until the neighbor starts unloading about his horrible life after only a few minutes. The once fat girl from high school who is now hot but crazy. As he meets more and more people, more and more silly and crazy stuff happens and all this guy really wants is a nice, regular cup of coffee. It begs the question: Will our hero get his cup of coffee and in so doing, find happiness? This is writer/director Jan Ole Gerster's first film and it's shot in beautiful, colorful black and white with a jazzy score reminiscent of Woody Allen and Jim Jarmusch films. Rosy the Reviewer says...if you like Jim Jarmusch or Woody Allen movies and you are not put off by black and white or subtitles, you might like this. If you are under 35, you will definitely like this. A young couple move into a new home and start experiencing demonic episodes. Moral: You don't want to mess with demons! These are the kinds of movies I usually don't watch because I am scared to and then when I do finally watch them, I realize they are not scary and it was mostly hype. I will give this film props for the improvisational acting that gave the film a sense of reality and the use of the night vision camera was interesting, but all I could think of every time the young couple got up to investigate strange sounds was if you think there is a demon in your bedroom "TURN ON THE FRIGGIN' LIGHTS!" Yes, it was creepy but not that scary. Why it's a Must See: "(to date, it is the most profitable movie of all time)...Oren Peli, a first-time filmmaker who shot the film in his own home for around $15,000...Anybody who likes being scared silly will love [this film]." So we have a low budget film that made a huge amount of money (think "The Blair Witch Project" but not as scary) and now a whole franchise has been born. We are now up to "Paranormal Activity: The Marked Ones," number five in the series. But does low budget and spawning a franchise a classic film make? 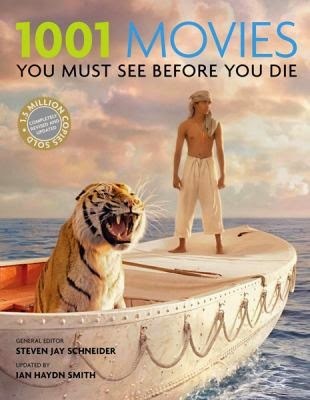 One that I need to see before I die? Rosy the Reviewer says...Really? I needed to see this one before I died? Nope. Sorry. 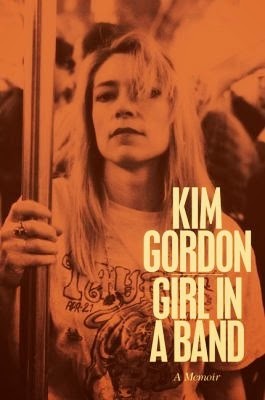 One of the founding members of the band Sonic Youth and an icon of her generation tells her story. Kim Gordon grew up in Southern California during the 60's and 70's in a middle class family with a professor father, stay-at-home Mom with a penchant for sewing flamboyant clothes and a schizophrenic brother. Her brother terrorized her, yet she idolized him but her experiences with him drew her inward. She was an artistic type who traveled to New York City to be a part of the art scene of the 80's. It was there she met Thurston Moore, who was to become her husband and fellow band member. Together they founded Sonic Youth, one of the iconic bands of the 80's. Gordon admits that she is someone who is withdrawn in her personal life and then lets it all hang out with her music. Lucky for us she lets it all hang out in her memoir - not in a juicy, dishy tell-all way but thoughtfully revealing in an almost detached shy way. However, she isn't shy about weighing in on Courtney Love and other musicians. She also laments what New York City is like today compared to the love poem she remembers and shares what it's like to be a woman in a rock band. She and Moore were married for 27 years, something that is amazing for the world they lived in. My daughter was a fan of Sonic Youth and was among those who felt that if Kim and Thurston could stay together, then there was hope for us all. When it was announced that they were splitting, the social media response was viral. Gordon acknowledges that, but is resigned to the fact that even they were not immune to the cliché - Thurston's other life with another woman and Kim discovering that through text messages on his phone. Here's a tip when reading memoirs written by musicians. Listen to their music while reading, especially if you are not familiar with it. I have been brought to a whole new musical level by creating my Sonic Youth Pandora station. I now not only have some knowledge of Sonic Youth, but I can also now recognize The Pixies and Radiohead. Rosy the Reviewer says...whether you are familiar with Sonic Youth or not, this is an honest and poignant memoir of a girl, a marriage and a band. Highly recommended. Never heard of Jacques Brel? He was to the French-speaking world what Frank Sinatra and the Beatles were to us in the U.S.
First staged off Broadway in 1968, this musical review of Brel's songs resonated with the public because of his anti-war lyrics and aching love songs. Four singers, two men and two women, sing 26 of Brel's songs, translated into English, including the familiar "Ne Me Quitte Pas ('If You Go Away,' the only one sung in French) and "Amsterdam," which have been covered many times by other singers. 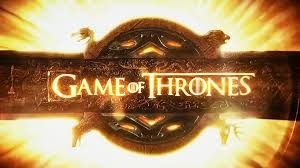 I can't believe it's taken me 47 years to finally see this show. Rosy the Reviewer says...the show is an exquisite jewel of music and emotion. If it comes to a theatre near you, don't do what I did and wait 47 years to see it. In fact, don't wait at all. Don't miss it! (Now playing at the ACT Theatre in Seattle through May 15). (And Some Travel Tips You Can Use Anywhere)"